Home » Blog » Icy Roads Caused an Accident. Who’s at Fault? A Car Accident Attorney Explains. Icy Roads Caused an Accident. Who’s at Fault? A Car Accident Attorney Explains. Were you recently injured in an accident on an icy road? If so, you may be eager to file a legal complaint with a car accident attorney. However, before you can do so, there is the matter of who to assign the blame to. This is an issue that can be very tricky to determine so you need to get it right before you file your claim. A car accident lawyer is the perfect person to talk to before you take this important action. How Does an Insurance Company Determine Who is at Fault? If you have recently been in a car accident on an icy road, you may feel that the conditions of the road or the actions of the other driver were to blame. After all, you don’t want to have to own the full share of responsibility for causing the accident. However, when it comes to assigning blame and providing coverage for the accident, your insurance company will naturally want to know all of the details involved. 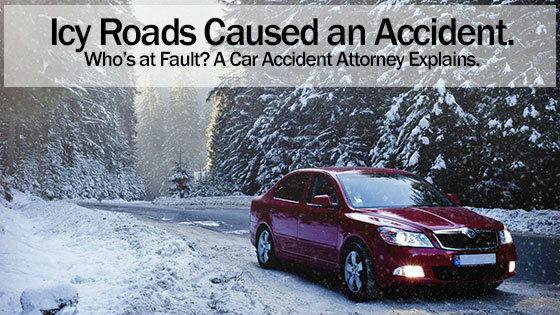 What were the conditions of the road at the time of your accident? Can bad weather conditions be blamed for causing this accident and possibly others in the same area and time frame? How fast were you driving at the time you were involved in the accident? Were there others at the scene of the accident who are willing to act as witnesses, whether on your behalf or someone else’s? Is there any photographic evidence that can prove your version of events to be the correct one? The insurance company may acknowledge that the road conditions bear some of the blame for the accident occurring, but it is the driver who may be faced with an insurance increase. This is why it is imperative to have an experienced car accident attorney on your side to help review your case and determine if you have a case. In many cases, if you have not properly adjusted your driving style to avoid a possible accident, your insurance company will judge you to be at fault. This will be true even if you feel that the true cause of the accident was an icy road or hazardous weather conditions. You need to keep in mind at all times that your insurance company is in business to take in money via premiums, not pay it out to anyone who asks for it. An experienced car accident lawyer can help you in understanding the common tricks that insurance companies use to limit or deny your claim. They can help you maximize how much compensation you are able to get from the insurance company. This does not mean that you simply need to accept the judgment of your insurance company. If you feel that your claim was dismissed or that you were judged unfairly, your best bet is to challenge the decision. You can do so by filing a claim with a car accident attorney. The sooner you do so, the sooner you can claim the full amount of the damages that you may be owed. Your car accident lawyer can help your case by assembling all of the evidence that you will need in order to prove that your side of the story is the correct one. For example, if you have committed a clear traffic violation just before the accident, you will usually be held responsible. However, if there was no such violation, you now have a chance to prove that you were unfairly treated by your insurance company. They can also help you to avoid accidentally incriminating yourself or contradicting your own testimony during a hostile cross-examination by the opposing lawyer. Your lawyer will act as your representative in order to see the case through to a successful conclusion.